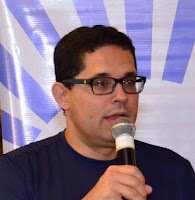 Professor Julio Francisco Dantas de Rezende (Natal-Brazil - 1974) was the first Brazilian to publish a research about Mars during the 19th Mars Society Convention in Washington D. C. at 2016. In Brazil he is coordinating 4 pioneering initiatives related to Mars education and science and technology popularization: the research station Mars Habitat (www. HabitatMarte.Blogspot.com), MarsLab - Laboratory of Technologies Applied to Mars and Semiarid (wwwMarsLaboratory.Blogspot.com), Mars Research Group - Mars and Arid Regions Settlements Sustainability and the Museu Espaço Marte (www.espacoMarte.Blogspot.com). The professor is interested in research about climate change, Mars, sustainable development of semiarid regions, economic development, entrepreneurship and sustainability. He is acting in sustainable construction in communities. Rezende is Bachelor in Management and Psychology, master and PhD on Sustainability at the Universidade Federal do Rio Grande do Norte (UFRN) and concluded the post doc in University of Central Florida researching about the support of Business Incubators and Science Parks in the creation of new clean tech companies. Julio Rezende has published more than 10 books about sustainability and innovation teaching in the Industrial Engineering Department of Universidade Federal do Rio Grande do Norte (UFRN). Rezende is president of the Management Council in Brazil (CRA-RN), innovation diretor of Foundation of Support of Rio Grande do Norte’s Research (FAPERN), performing lectures in different countries about sustainability, innovation and management in English and Spanish. More information about professor Julio Rezende: www.juliorezende.com.